Bring your family or friends for an action-packed winter holiday in Sweden with lots of fun winter activities. How about a dogsled tour or snowmobile adventure in the forest? 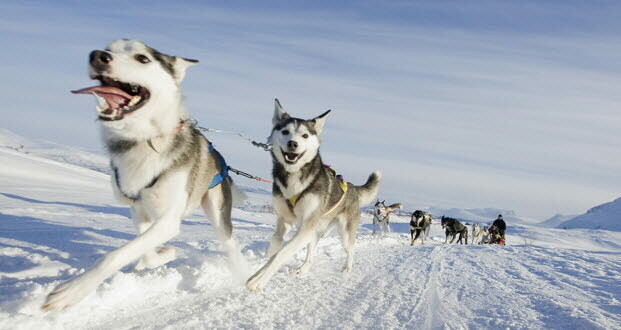 Travelling in a dogsled is a wonderful experience. In some places you can book a stop with coffee or even lunch made over an open fire. Enjoy a dogsled tour in winter at one of the following campsites. Learn to drive a dog team on the bare mountains. When the sleds are fully loaded, we set off through the silent forests and over the majestic mountains. Snowmobile tours are a very popular activity for winter holidays. Snowmobiles can take you across roadless landscape, close to nature. The following campsites offer snowmobile tours. From the campsite you can make your way out onto several snowmobile tracks and drive around in Orsa or to Grönklitt, but there are also opportunities to take longer tours, for example up towards Härjedalen. Snowmobile tracks outside the door, 25 minutes to Kungsberget.